The dragons have awakened. Their leader, Kraegyn, has risen from the ashes. Lucius Nostra suffers recurring nightmares of the black dragon. The frightening dreams signal the ominous return of the dragon tribes that wreaked havoc on the peoples of Azuleah. Confused and uncertain of his role in the gathering storm, Lucius joins his elf brother Siegfried on a perilous journey to reforge the Requiem Sword--the blade which once defeated Kraegyn. Lucius' quest will take him through the kingdom of elves, dwarves, and faeries. Though he will gain allies on his quest and uncover secrets surrounding his past, can Lucius survive long enough to stop Kraegyn's ascension? 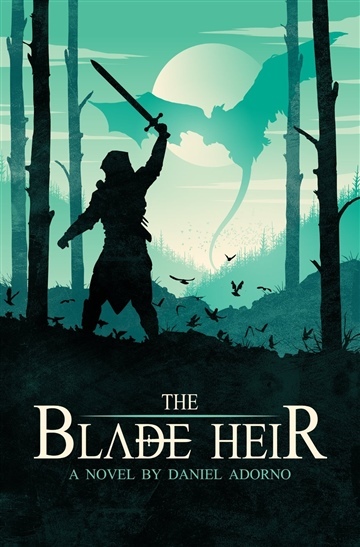 The Blade Heir is Daniel Adorno's first novel in a series of Christian fantasy for teens and adults. This is an epic fantasy adventure readers of all ages can enjoy! Daniel Adorno is a fantasy and sci-fi author who occasionally blogs about the independent publishing industry. Daniel was born in Puerto Rico and moved to the state of Florida at an early age. He earned his Bachelor's degree in history at a private Bible college in Minnesota and went on to earn his master's degree in ancient and classical history. One of his short stories placed him as a finalist for My Faith Radio's 2013 Writer's Contest. When he's not writing, Daniel likes to read speculative fiction and create digital art for book covers. Daniel currently resides in Farmington, Minnesota with his wife and two sons.